Western Swing Music is fun music with a BEAT and tremendous feeling! 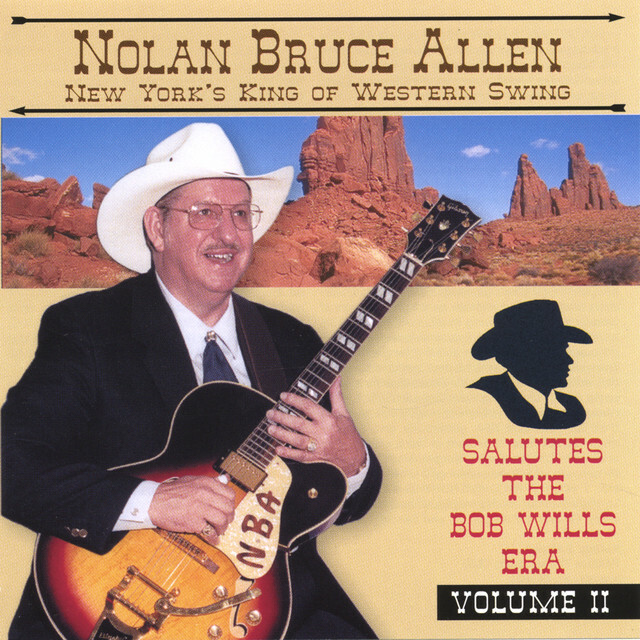 Uniquely American, it was developed by the Legendary Bob Wills with his superb up to 21 piece Texas Playboys Bands beginning in the 1930's. 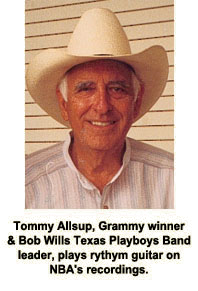 He utilized only the finest musicians of his time, a trend that continues to the present day as Tommy Allsup, producer of Bob's "FOR THE LAST TIME" recording session and Leon Rausch, main Playboys singer in the late 1950's and early 1960's continue on with the name. NBA recorded at the historic A.S.C. Sumet Studios in Dallas, Texas where "For The Last Time" was done. Tommy played rhythm guitar on NBA’s entire 67 song project. 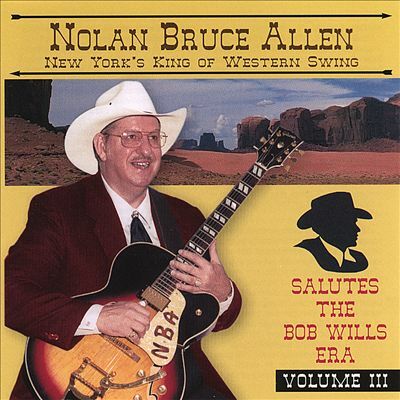 Bob Wills blended Jazz, Country, here and there some Dixieland - then put it all together with a clean, driving, dynamic Big-Band sound to create Western Swing. 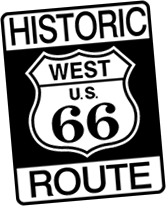 The music with its lovely and romantic melodies, ear-catching words, arrangements and often intricate chord patterns was heard and loved coast to coast, especially in the southwest where it remains big. And it is showing resurgence everywhere. 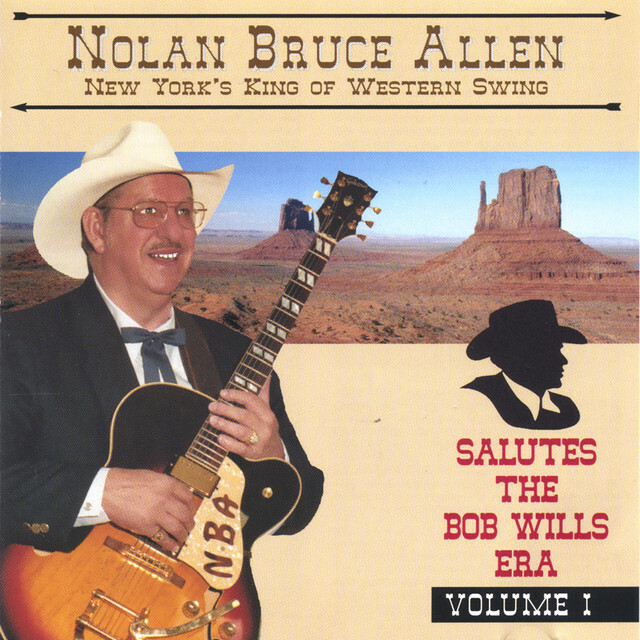 Many entertainers and musicians acknowledge Bob Wills as their biggest musical influence. At his dances fans often stood 30-deep around the bandstand listening and watching in awe to the man who became the ultimate "King Of Western Swing" music. It utilizes its musicians as does no other music form featuring hot Steel Guitar, Piano, Fiddle and Lead Guitar solos. Add to that a super-clean driving rhythm section, two and three part harmonies on Vocals, Fiddles, Guitars, even Horns and - WOW! Often the band is featured as much as the vocalist(s). Western Swing is very pleasing and enjoyable family listening music that you can have a ball dancing to! Thanks to Cindy Walker and the other fine writers whose material he used. 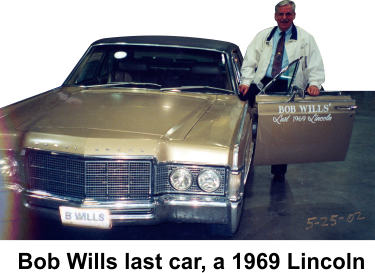 And a special, heartfelt "Thank You" to Mr. Bob Wills for the songs he wrote and the more than 600 recorded. For giving all of us this wonderful, driving, sweet and toe-tapping "Western Swing Music" to forever treasure.